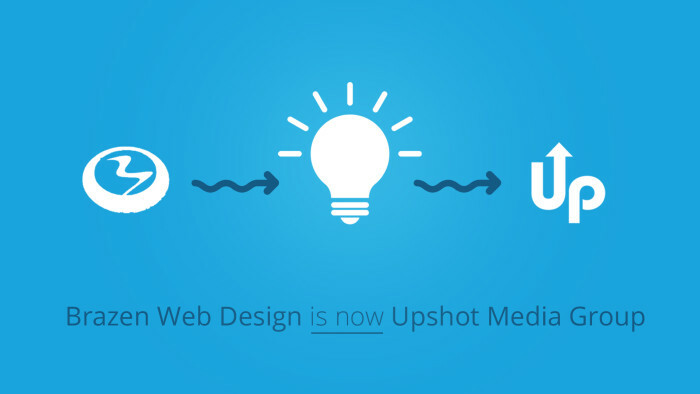 Following a complete re-branding effort, Brazen Web Design has now become Upshot Media Group. Offering the same custom-built Web and Mobile solutions, Upshot Media group will also offer a full complement of digital online marketing, production, and creative services. Formerly Brazen Web Design, one of the leading web design and mobile application development companies in Kansas City, is pleased to announce the result of their highly anticipated new branding campaign, and will now be known as Upshot Media Group. While continuing to provide cutting-edge web design services, Upshot Media Group will also provide a full range of digital marketing, production, mobile app development, and creative solutions to help new and existing clients maximize value in the digital space. The name change is meant to better represent the totality of Upshot Media Group’s capabilities, and is just one step in a broader effort to meet all of their client’s online needs. As the nature of business depends more and more on the digital world, companies are discovering that their website, e-commerce, online marketing, social media, customer service, sales channels, and brand management are all tied together and require a global solution. With a staff of web-designers, mobile developers, marketers, and digital artists, Upshot Media Group can fulfill any requirement and specializes in developing omni-channel digital marketing campaigns. By offering all services, Upshot Media Group can better provide synergy throughout multiple platforms, as well as provide more value and return on investment. For over 15 years Upshot Media Group has delivered the highest results in web design and online marketing. Founded in 1999 as a one man operation, Upshot Media Group has grown into a full-service web development company with offices in Dallas, TX and Kansas City, KS. Upshot Media Group has achieved this amazing growth by remaining true to its core values and practices, giving the customer exactly what they want, when they want, at a reasonable price. Upshot Media Group sets the standard for what you can expect from a digital solutions provider.